Learn some of the pros and cons of better comfort through glazing, reducing heating costs/carbon too. We wanted to fix our old, ugly, leaky, misted double-glazing so we upgraded to triple. We're happy with the results. Though we've had a couple of explosions (yes, indeed) along the way! We tried to get triple glazing (AKA "triple-pane" windows or "3G") sorted when super-insulating our living room but did not get very far. Even the quotes were painful to get. This year (2012) we decided that since so many of our double-glazed (2G) units are leaky and misted/blown and generally an eyesore, we'd like to try changing some or all of them out for triple glazed (3G) units. An important step was to call the council (2012/07/02) to ensure that as long as we use a Part-P/FENSA installer that building control won't need to be involved. (Planning confirmed also that if we're being sensible they don't need to be involved.) Hats off again to RBK BC and Planners! This project is primarily driven by aesthetics as the misted windows are very annoying. Repeatedly trying to tackle the air leakage is also annoying. Clearly I'm also going to try for quite a lot of improvement given the expenditure of just getting fitters to turn up, thus the 3G. Technical bit: assuming that the existing 2G is ~2.8W/Km^2 and ~10m^2 and average temperate drop across the window is ~10°C (7°C external, 17°C internal) and given an average heating load across 6 months of ~4MWh (minimum) or ~900W then at most the windows could drop that by ~200W. But 100W or ~10% might be a more reasonable hope, so ~400kWh of gas or ~76kg CO2 per year saved. So that's about five times my previouly declared 500kWh/year/£1000 carbon target for heat savings. It nicely illustrates why window replacement should generally low priority from a purely carbon-cutting point of view. For windows at the front (east) of the house, the windows' U-values will now be about as good as that of the walls they sit in, astonishingly. So drawing curtains to reduce heat loss will be of marginal value! In the aerogel dry-lined walls with U-values between ~0.21 and 0.3W/Km^2 the new windows will still be significantly worse than the walls. So drawing the thick/lined curtains at night will still be a useful exercise from a heat-loss perspective. 2012/07/05: Hurrah, our favourite local Warmlite now does 3G: "With the addition of a glazing flipper and a thermal dam the window is Passivhaus Compliant. The 'U' value [for the complete window] is 0.8 W/m2K." 2012/07/09: Warmlite visited today to measure up to get us a quote. Warmlite would apparently source the 3G units from Whiteline using their new 70mm profile. ... PlatinumNRG Triple Glazing far exceeds current Building Regulations on thermal efficiency and is Passivhaus Compliant. A note of caution is that the cills are bog standard with three cavities - the outermost cavity essentially open to outside and that it seems standard practice is to just sit the window on it (not very airtight). Glad I was home to insist that we water mist and PU fill the inner cill cavities and that the cill is siliconed onto the window! If you get the fitter to cut the cills to length you can then fill the rear cavities and give them some time to set before trimming them back - otherwise you risk making a real mess. Silicone should go along the back very back of the cill to prevent drainage issues. You may also need to make a 'bespoke' long tube to fill the rear cill cavities with (two feet of hozepipe off-cut tightly over the end of the gun works well). Of course white line might do U=0.8 cills but I wouldn't count on it! 3c) bathroom and toilet window. 3) No lamination other than required for safety/building regs. throughout (possibly not on bathroom/toilet window). and being careful not to damage existing aerogel drylining where present. to the PVC in particular). 9) Your usual 10-year guarantee. 10) The above points included explicitly in the purchase contract. £4220 plus possible extra for (6) to be agreed. I'm paying a 25% deposit today, full survey is due 2012/08/02 (was going to be the 1st at noon but the Olympic Cycling Time Trials might mess up traffic! ), install some time in September. 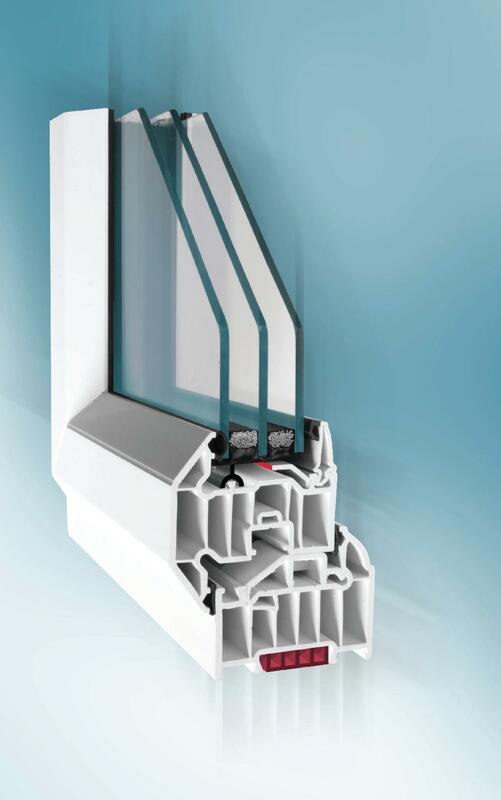 The make up of the triple glazed units is as follows: External pane of 4mm Clear Float/12mm Argon gas-filled cavity/4mm Planitherm Total+ Clear Toughened Safety Glass/12mm Argon gas-filled cavity/4mm Planitherm Total+ clear inner pane. The spacer bar in between the panes of glass is a 'Swiss V' Warm-Edge bar. See the profile c/o Warmlite; note the addition of the 'flipper' gasket and thermal insert. 2012/08/02: survey done today. I stressed issues of air leakage and thermal bridging. Existing reveals (including aerogel ones upstairs) will be left as-is, and resealed with good anti-fungal stuff. Hoping to have work done before Open House weekend in September so we can show new windows off to vistors! 2012/08/15: originally I wanted the living room replacement for the second patio door to be entirely one fixed light for an unobstructed view of the garden. Having been told that that wasn't possible while achieving Passivhaus requiring thicker (6mm vs 4mm) glass and preventing use of a warm edge spacer, I was persuaded to have an openable window at the top (horizontal transom). That should in fact make it possible to externally ventilate the living room room without actually leaving a door ajar as we've had to until now. Warmlite called today to say that the bottom part cannot actually be done all in one piece for the same reasons, so have suggested a horizontal transom bar of ~70mm width at a height of ~800mm or a little less. I've urged them to make it as low as reasonably possible to minimise obstruction of the view when sitting on a chair/sofa. We do now have an install date in early September, in time for our SuperHome open weekend later in the month! 2012/09/11: yesterday and today the windows were replaced, three windows at a time, upstairs first. 2012/09/12: it was ~8°C or cooler overnight and condensation on the outside the rear windows upstrairs only, which is good. ~7°C has been the outside temperature below which condensation has typically formed inside those windows before (B3G!). We noticed that the child-safety locks are not that robust, and could be defeated by the kids with a little effort. So I had a word with them about safety and not standing on furniture near open windows, etc. Also, the locks aren't click-to-lock like our old ones, but actually need the key. A minor issue, but needs slightly different 'key management' algorithms! 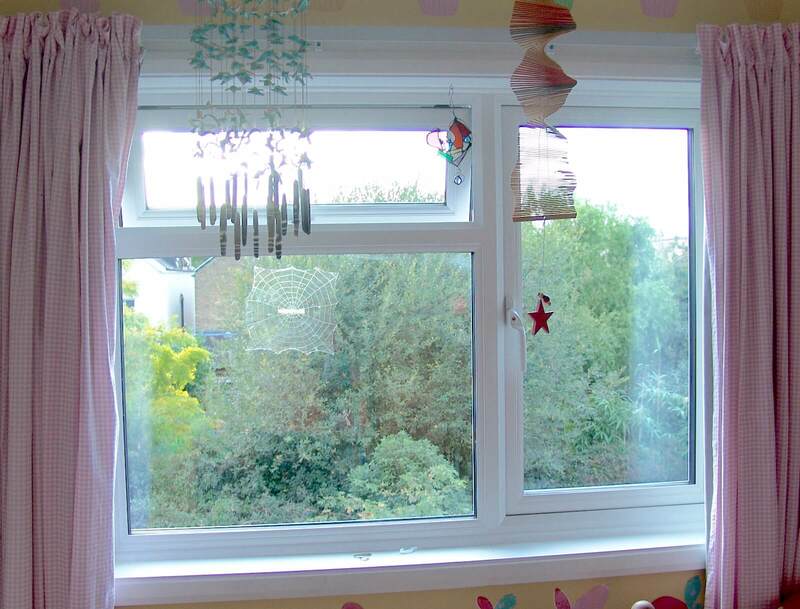 The internal cills are narrower than before due to the fatter window profile. In the bathroom we've removed the grotty wooden reveals and put in a tempoorary plastic reveal, lightly attached for easy removal. We can slip in insulated reveals to minimise condensation / heat loss. And we can consider a ventilation grille between bathroom and toilet so that the latter gets some of the fresh-air benefit of the MHRV. Anyhow, all done, and we're pleased with the look, especially in the living room, without the old fat vertical mullion. The sound-proofing of the new windows seems good too. 2012/09/22: there have been several nights now where external air temperature has been a degree C or so either side of the magic ~7°C at which condensation used to form inside the windows. Often some visible outside but none inside now! 2012/09/29: extensive dew/condensation on the outside of almost all windows and doors this morning (not noticably on sheltered front door) and a tiny tiny bit of condensation in (bottom) corners inside in bedrooms. Lots of dew on cars and garden furniture also for example. So presumably quite humid last night before temperatures dropped to ~9°C. 2012/10/02: BBA ispection of behalf of FENSA finally happened; a couple of interesting laser/continuity gadgets were used to check for presence and location of low-E coating and for glass spacing, and the triple-glazing and >40mm depth caused slight indigestion for one of them! 2012/10/04: dew/condensation on the outside of almost all windows at ~6am with outside air temperature ~7°C. Boy's room still reasonably warm at that time, which is good. 2012/10/07: ~5°C outside overnight and lots of dew at ~8am; a small amount of condensation inside on lower corners of kids' bedroom windows and double-glazed living room windows. None at all on triple-glazed living room windows for example. 2012/10/14: not much above freezing overnight (maybe ~2°C) and much dew evident on outside of most windows (though lowest porch iButton reading 5.5°C), with a tiny amount of condensation in bottom corners of several windows. The rest of the family was away, so that mainly represents 'standing' humidity in the house. Quite noticable condensation on inside of rear 2G doors including bottom of flying mullion and other 'openable' frame parts: those will be the ones to watch for mould, etc. Interior temperatures dropped from ~18°C to ~16°C overnight. In the afternoon on the west of the house temperatures came back to ~18+°C with direct sunshine. 2012/11/12: some pictures showing thermal bridging through the frame with some condensation near the frame on the inside where the inner pane is coolest, and a lack of dew on the outside where that same flow of heat is keeping the external pane warmest. We're seeing more nternal condensation than I'd like on very cold nights, but I know that we need to keep working on ventilation to keep RH down. 2012/11/24: we're continuing to see some internal condensation after cold nights. Though less than before I think. We'll need to see some really cold nights to make sure that we're not getting the huge quantities that we used to. I suspect that the volume of water condensed will be in proportion to the U-value / heat flow given the latent heat of evaporation that has to be removed. So, the occasional wipe-down of the windows will remain necessary. As will be working on keeping RH below 70%, which seems to be key. It seems very roughly to require outside temperatures below 7°C and internal RH over 70% to get significant internal condensation on the triple glazing. 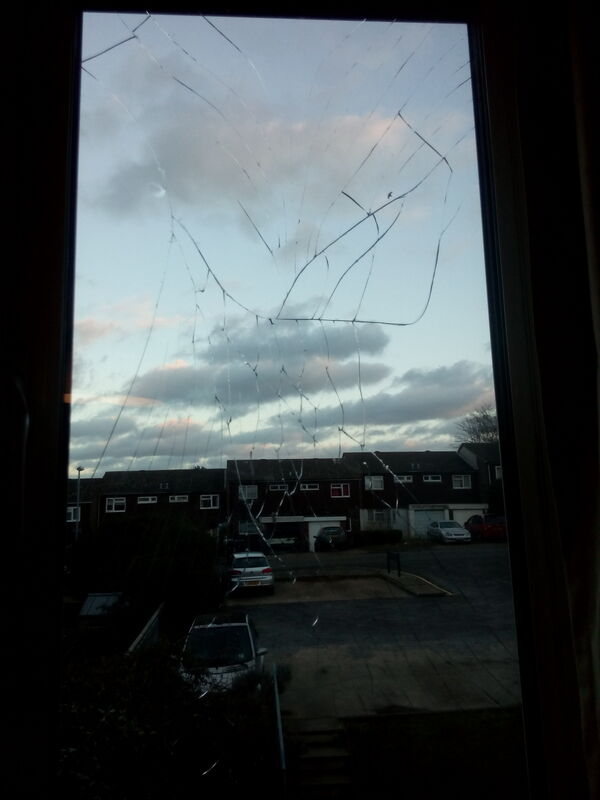 2013/11/11: rather alarmingly, in the middle of the night, for the two smallest 3G sealed units that we had fitted about a year ago, the outer panes of glass spontaneously shattered with a muted bang (midnight for the bathroom, 3am for the toilet). This would have been the coldest part of the night at ~3°C. I looked around for evidence of foul play (eg air-rifle pellets, teenagers prowling, other damage) but did not see any. And I can't imagine that it was a bat strike for example. The muted bang at 3am was followed but a series of quieter noises, which I assume were other cracks forming as stresses were relieved. Very odd. 2013/12/02: shattered windows replaced, seals/positioning on all windows inspected and adjusted as necessary; thanks Warmlite! 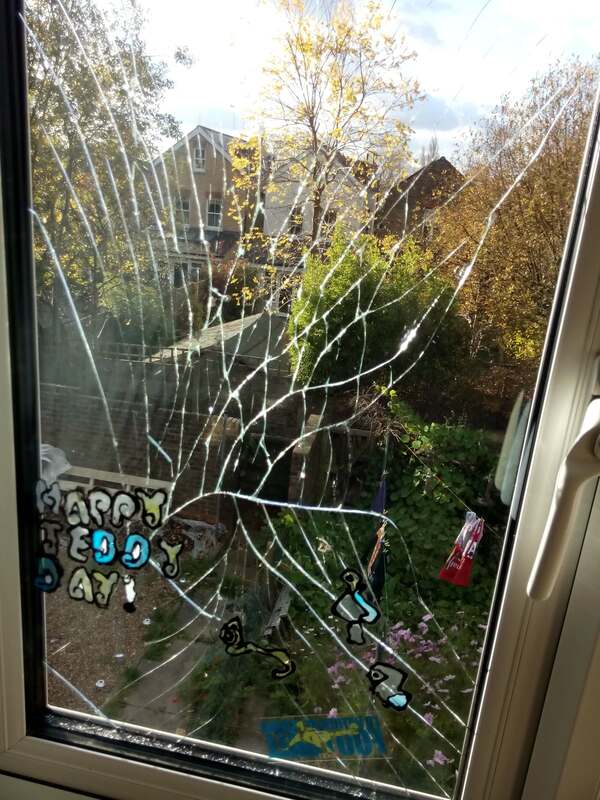 2017/11/07 evening: downstairs watching TV the family heard a loud noise which in the morning turned out to be the outer pane (of the opening part of the window in the boy's bedroom) partly shattering. The outer pane is cracked throughout, with some tiny flakes of glass visible in the outer cavity. Unremarkable external temperature of ~10°C, internal ~15°C. The inner panes and thus the window as a whole are still functional; we're just down to (good) double glazing for that part! 2017/11/13: the man from Warmlite has been here to look, helpful as always! 2018/01/03 ~01:55: Guess what? I was woken from sleep by a bang, which I thought was my computer screen exploding. Except that now I have a laptop, that would be difficult... Our (master bedroon) side-opener outer pane had failed with much the same fracture pattern as the boy's room window. It's rainy and a bit windy, ~10°C outside (9.625°C in the porch, 9°C according to the BBC weather) ~18°C inside (18.25°C at the rad, and 16°C at the other end of the sill reported by a SmartThings sensor that I happen to have sitting there), so nothing dramatic thermally or otherwise. Are we suffering from a Nickel Sulphide Inclusions problem? Velux have had a well documented failure in some of their double glazed rooflight units with inner panes of float glass breaking. 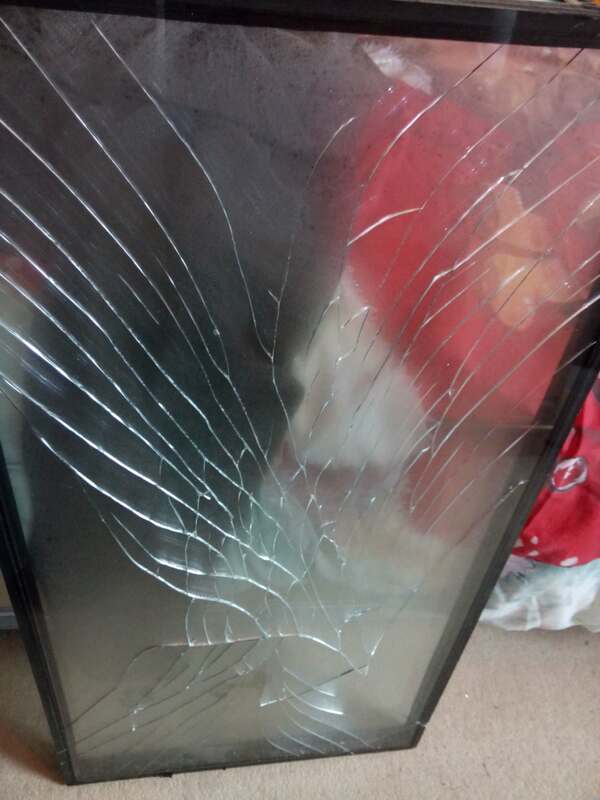 I believe the problem was caused by failure of the edge seals allowing the argon gas to escape resulting in changes in pressure that the float glass couldn't withstand. If your issue is not one of edge seal failure the other main suspect would be that the glass units were fitted too tight to the frames with not enough allowance for differential thermal movement between the glass and the frame. The problem won't be nickel sulphide inclusions as that only affects toughened glass. 2018/01/12: Warmlite has been and replaced the failed unit in ~10 minutes. 2017/12/15: Loft conversions and energy saving ambitions: "Insulating without installing energy efficient windows would be a mistake. Look to install the best-performers you can afford; A+-rated double glazing can bring significant bill savings, and you could go further still, for triple-glazed. Good quality windows not only bring lower bills and a warmer space, but excellent noise-proofing and reduced condensation build-up." Photos of the 2G to 3G upgrade. GBF thread on this work. Whiteline UK fabricator of PVCu windows and doors. Enviroform's Magnaline Reveal aerogel-insulated window reveals. Did you know that you can get triple-glazed stained glass, even in fairly slim configurations, argon-filled, low-E plain outer pane(s), warm-edge, etc, thus preserving your art and the planet at the same time? For example Simone Kay does this. First published 2012-07-02 , updated 2019-04-22 . Site copyright © 2007-2019 Damon Hart-Davis. Hosted by ExNet.